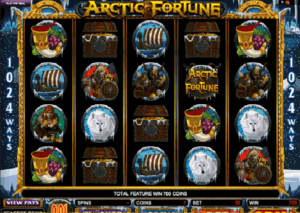 Fruit Slots is designed by Microgaming as a 3-reel, 1-payline slot that you can play at casinos such as All Slots Casino and Cabaret Club Casino. With fruit symbols such as the watermelon, plum and orange (as well as the trusty old one, two and three bar symbols), Fruit Slots is a very distinctive and fun slot game to play, whether you live in Canada or elsewhere. 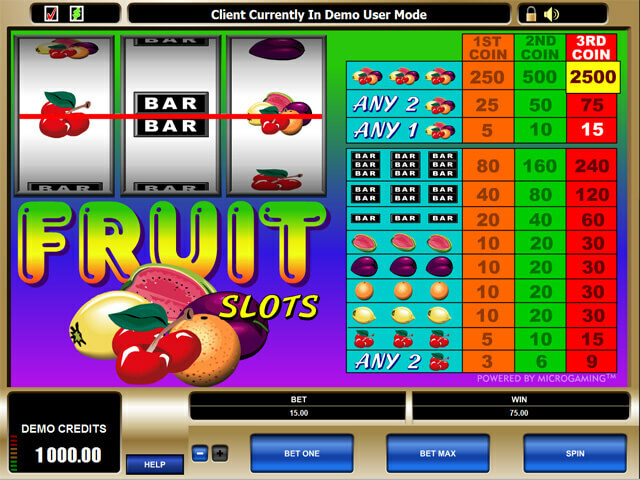 Fruit Slots is available only as a 3-reel, 1-line slot. 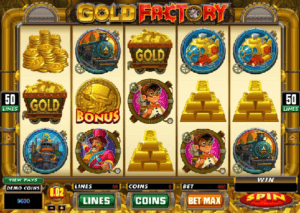 The coin value can be set by the player between 25 cents and $5, while the maximum number of coins you can bet per line is three coins. 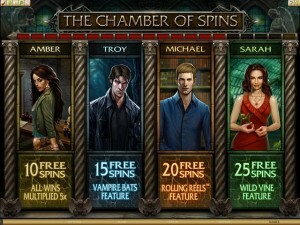 The maximum wager per spin is $15. 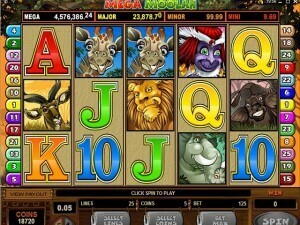 There is a scatter symbol, though there is no progressive jackpot, bonus game or wild symbol. Other than the minimum coin value of 25 cents and maximum of $5, other coin values are also available in between the two amounts, including 50 cents, $1 and $2. 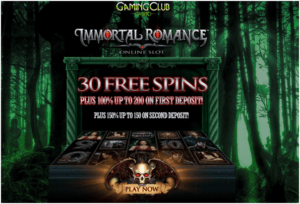 With just one payline to play, this is a slot where you can generally afford to wager a bit more in coin value, if you wish. After all, the value of your jackpot will increase if you play at a higher coin value. 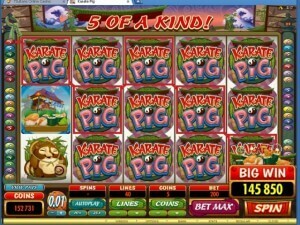 In Fruit Slots, the highest jackpot payout is 2,500 coins. 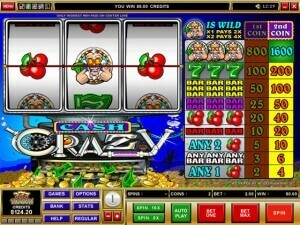 With a maximum coin value of $5 and a maximum bet of 3 coins, players can win $12,500 with the biggest available jackpot in Fruit Slots. 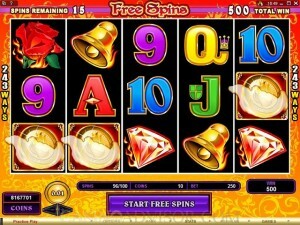 As it is with the rest of the game, the jackpot rules in Fruit Slots are very simple. The most valuable symbol in the game is the “fruits” symbol, which is a picture of all five fruits used in the game shown all together. 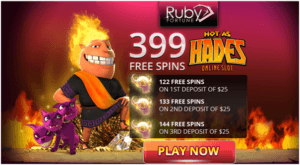 You need to get three fruits symbols on the payline in order to win the jackpot. 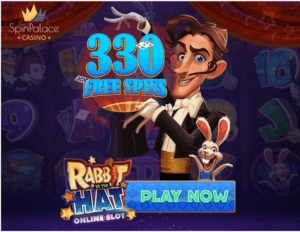 Remember, to win the full 2,500 coin jackpot, you have to wager three coins. 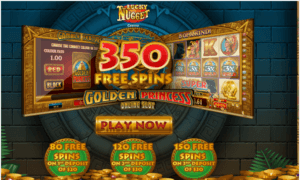 If you wager one coin and hit the jackpot, you win 250 coins. If you wager two coins and hit the jackpot, you win 500 coins. There is no progressive jackpot associated with Fruit Slots. 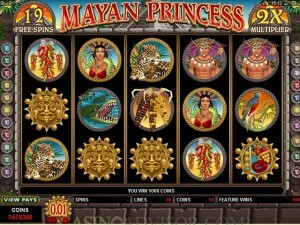 If you’re looking to have some fun with a new slot game, you can do a lot worse than Fruit Slots. Fruit Slots combines simple, classic slot game design with modern graphics and sounds. There are modern features such as auto-play that you would expect to see, as well. You can even play the game in your browser without downloading software, which is a nice bonus. Though there is just one payline, being able to select from one to three coins per spin is an easy way to manage your wagering.